Impress your friends and family with this easy melt-in-your mouth buttermilk biscuits recipe. Made in less than 30 minutes time! Let’s take a break and talk about breakfast for a quick minute. We love it in our home. Nothing is better then bacon, eggs, potatoes maybe even a little sausage gravy on a thick and fluffy buttermilk biscuit. 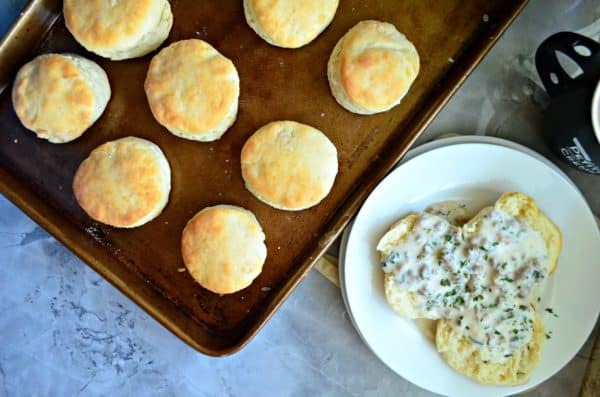 The problem is –most people either don’t know how to make mouthwatering biscuits or they are straight up intimidated by the thought of even making your own. I’ll raise my hand. I was one of those until last year. I tried my hand at so many different biscuit recipes for years always resulting in a dry thin hockey puck. That was until I went on a media trip with the Florida Beef Council. That’s when I learned the secret to making the best buttermilk biscuits around. So what does beef and biscuits have to do with each other? We had the most amazing home cooked southern breakfast on a cattle ranchers summer home one of the mornings of my trip. Their entire family cooked the breakfast from scratch. One of the sweet daughter in-laws, Annie, made the most amazing buttermilk biscuits. I pressed her for the recipe and she wouldn’t divulge; however, she did say that the key to the ultimate buttermilk biscuit is Crisco. Don’t be intimidated by it. Grab it by the stick and show it whose boss! My husband was in biscuit and gravy heaven for weeks and weeks. He was happy that I had finally mastered yet another favorite food of his; the buttermilk biscuit. And I’ll be honest, pretty darn proud of myself for conquering my biscuit fears. Making buttermilk biscuits is actually really easy. The key is finding the perfect recipe to make fluffy biscuits. You can mix the dough by hand or let your stand mixer do a little of the mixing. I don’t use a rolling pin either. I actually prefer to hand pat the dough to a somewhat even level, so that I don’t over work the dough. Plus, I’m lazy and I don’t like to have to clean up anything extra. That is one of the keys to making fluffy buttermilk biscuits–do not overwork your dough. 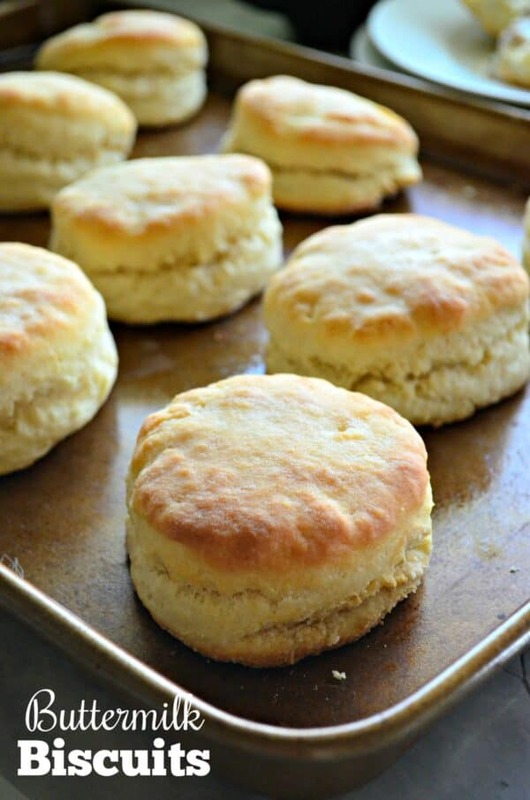 So if your like me and have been searching for years to find the perfect buttermilk biscuit recipe, then I invite you to give this recipe a try. I promise it won’t disappoint. The result will make you a biscuit making pro in no time at all! Preheat the oven to 450°F. Coat cookie sheet with no-stick cooking spray. While the oven preheats add flour, baking powder, baking soda and salt in a stand mixer fitted with a paddle attachment. Add the Crisco and mix for 30 seconds to 1 minute on speed 2/4 until mixture resembles coarse crumbs. While mixer is still running, pour in the buttermilk and mix until a soft dough forms. It needs to pull away from sides of bowl. Place the dough on a lightly floured surface and sprinkle additional flour on top of the dough (and on your hands so the dough doesn't stick to your hands). Knead 8-10 times until flour is incorporated then roll out to 1/2-inch thickness. 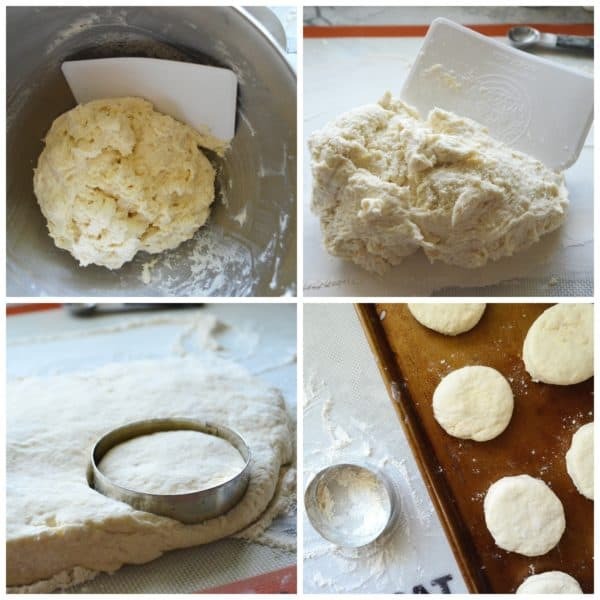 Using a biscuit cutter or a cup, flour the rim and and cut biscuit dough. Place the biscuits 2-inches apart on the cookie sheet. Bake for 10 to 14 minutes or until golden brown. 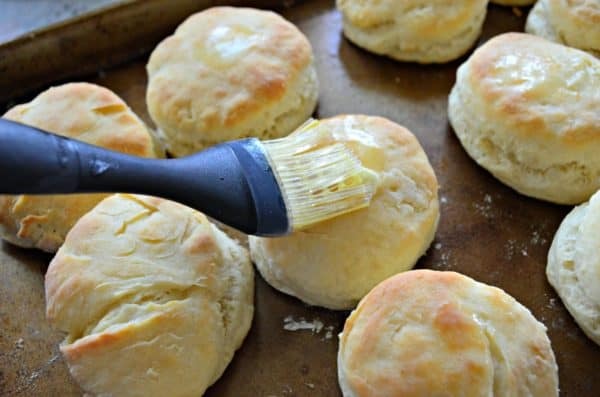 Remove the biscuits from the oven and brush with with melted butter. Note: This recipe will make exactly 12 biscuits. Towards the end of the dough you might have to re-knead/roll to get the exact amount.